Eating foods rich in omega-3 fatty acids can significantly reduce your overall cholesterol level and decrease your risk of developing cardiovascular disease. Certain types of tuna are particularly rich in omega-3 fatty acids and should feature prominently in your diet if you're struggling to lower your LDL, or "bad," cholesterol level. However, to maximize the benefits and minimize the risks of eating tuna for its cholesterol-lowering effects, you should follow some basic guidelines. Tuna, especially albacore tuna, contains a high concentration of two omega-3 fatty acids -- eicosapentaenoic acid, or EPA, and docosahexaenoic acid, or DHA -- that scientific researchers have identified as directly lowering cholesterol levels and reducing heart disease risk. Neither EPA nor DHA can be synthesized by the body, so consuming them regularly is essential for optimum health. Tufts University reports that you should consume between 7 and 11 g of omega-3 fatty acids weekly and that cold-water fish such as tuna is one of the best sources. The American Heart Association says that the best way to lower your cholesterol levels with fish is to eat at least two 3.5-oz. servings of albacore tuna or other omega-3 fatty acid-rich fish such as lake trout, salmon, mackerel or sardines weekly. Avoid frying tuna or preparing it with saturated fats such as butter. 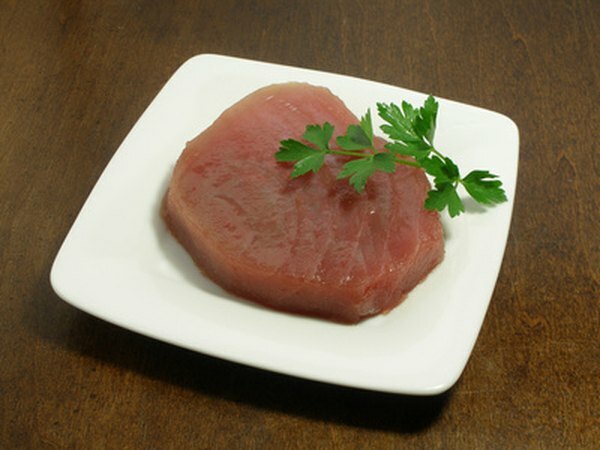 Instead, bake or grill tuna with a light coating of a monounsaturated fat such as olive oil. It doesn't matter whether you choose wild or farm-raised tuna: both have similarly high omega-3 fatty acid concentrations. Although canned and fresh tuna contain the omega-3 fatty acids that decrease cholesterol levels, fresh tuna contains significantly more: 1.504 g of both EPA and DHA for every 100 g of fresh tuna compared with 0.272 g of omega-3 fatty acids for every 100 g of canned light tuna in water. Light tuna canned in oil contains even less -- 0.202 g for every 100 g of fish -- although it is still considered an excellent source of the fatty acids when compared with other foods. The Food and Drug Administration warns that, because of the high levels of mercury that can accumulate in the bodies of large fish like tuna, young children and pregnant women should eat no more than 12 oz. of canned light albacore tuna or 6 oz. of fresh albacore tuna weekly to prevent the risk of neurological damage. Fresh tuna steaks are more likely to contain an elevated level of mercury -- over 1 part per million-- than canned light tuna, which typically contains 0.12 ppm per serving. If you consume fresh tuna, remove the skin and as much of the surface fat as possible before you cook the fish to reduce your mercury exposure.